Well-proven – now perfected. The LIGHTNESS concept created a new category of harness, and now this second generation takes the best of the original and adds to its safety, comfort and style. With a weight from 2.8 kg the LIGHTNESS 2 is a light harness, but, in its current form, it completely satisfies the needs of the ambitious cross country pilot. It has an integrated reserve, certified protector and improved aerodynamics; and again comes with its own rucksack, the LIGHTPACK 2; now including a COMPRESSBAG light. Our new reversible harness Emotion can be transformed with only a few moves from a harness to a rucksack and vice versa! Despite it´s low weight of only 4.1kg the Emotion is an absolute fully, very comfortable harness, which offers a great feedback to the glider and best flight-characteristics. Target group of the Emotion are not only alpinists who usually walk up to the take-off, but also all other pilots who follow the trend to lighter harnesses without making any compromise regarding the functionality and comfort. The Genie Lite is the luxury harness of choice. Suitable for a wide range of pilots who wish to fly with the option of a cocoon, ideal for cross country XC, longer flights and for flying with higher performance gliders. The Genie Lite offers benefits of our flagship competition harness, the Genie Race, now available in a lightweight, easy-to-use package with several outstanding features. The Genie Lite weighs only 4.6kg (M size including carbon seat plate and carbon footplate), yet still offers excellent durability due to the use of advanced materials such as Dyneema. The Genie Lite comes complete with its own flight deck which holds up to 5L of ballast, and additional storage (3L) is available in a pocket under the seat. The built-in speed system is supplied with Harken pulleys and there are additional loops to fit larger pulleys. In case the cocoon is not required, it is easily detachable. Certified lightweight canoe harness designed for beginners through to high performance and competition flying. Very well integrated instrument holder. The instrument holder can be used as a ballast container with a capacity of 4 litres or a second reserve container can be fitted. Stowage capacity for vol bivouac gear. Ram Air inflated tail section for improved aerodynamics. Good pockets accessible in flight with tie in loops. Italian sizing. eg I am 1.8m tall in shoes and I take a large! 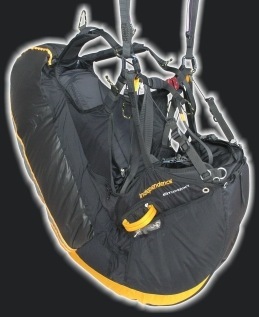 Delivered with: accelerator, mousse bag, reserve maillons, parachute handle and reserve parachute bridles.